a ska loving geek: our thoughts go to them..
what has happened in Japan is truly awful. any natural disaster is shocking by itself, but when a country suffers two in one day, then has to contend with a potential nuclear disaster, no words can describe it. Junko wong, who is big in the blythe world, is posting regular blog updates on the state of things. 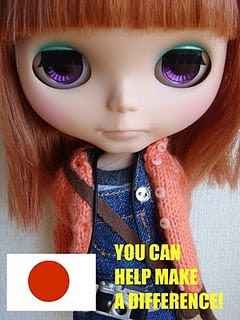 The Blythe world is general is being amazingly generous. So many people setting up auctions and things to raise money. The FishberryJam blog has a list of auctions and raffles currently running. Other things to do: donate to the Red Cross. i do a monthly donation. donate to Shelterbox. i have also done this. check out what they do. its amazing.